Add some boyish charm to your closet with Line + Dot's coat. This coat runs large. We recommend sizing down (see following fit notes for exceptions). Sized: XS-L.
Brown wool blend (80% Wool, 20% Polyester). Long sleeves. Outerwear. Fully lined. 45.5’’ from shoulder to hemline. Imported. Slouchy and wooly in all of the right ways. Ankle skimming. Bracelet sleeves. Cool color. Gorgeous color and oversized fit. Loved this jacket. Color was stunning. Had a great structured oversized fit- sleeves are meant to be shorter but it's nice to know ahead of time. Would rent again! Quite a boxy fit but great for Winter layering. Kept me really warm and is a great pumpkin color. I got a lot of compliments about the overall color and style of the coat. Go down a size or 2 depending on how you want to wear it. 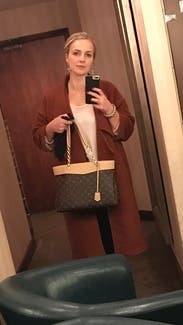 Super easy throw and go coat for anything - work, weekend, going out, etc. loved the burnt orange color. I loved this coat. I ordered a size up so it was a bit big but it worked. I kept for two months. Loved it! Seriously I thought I would freeze in it this winter, but as surprisingly it ended up being one of the warmest coats in my wardrobe(after discovering RTR I feel like throwing out everything in my closet -_-) rent it! Big thumbs up for this coat!!! It definitely is meant to be an oversized fit. I got so many compliments on it. The color is really unique, and I felt like I stood out from the sea of black coats. Poor quality or cleaned too many times? 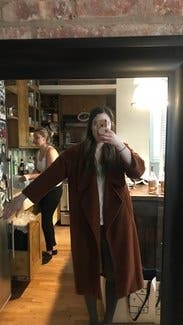 This waa like a clothing item you have to get rid of because it is starting to fall apart... Maybe the jacket has been worn or cleaned too many times, it looked very used and of poor quality.. fabric was pilling and seemed faded and overworn. It fit great so its a shame. First item ive gotten from RTR that didnt feel at least somewhat new. Love love love this coat! Where to start.. the color is great accent to any outfit! I love how the coat drapes, looks great in heels or flats. It's warm but if I was worried about being cold I would layer and there was plenty of room for that. I would've bought this coat if it had been in better condition. (It had a little too much piling and didn't sit quite right). But I LOVED wearing this to a chilly wedding (50 degrees and outdoors!). I got so many compliments and people were jealous of the longer cost for a chillier than expected evening. The fit is nice and easy. Loved it! It is chic. It is versatile. It is warm. It is comfortable. It is everything you could ever want in a coat. Deep pockets are perfect for extra storage and warm hands without anything falling out and still having room to spare. I wore it to a gala as well as walking about the city. I love this coat so much! If I didn't like switching things up I would keep it forever! Way too big. Nice fall color, but just didn't work. 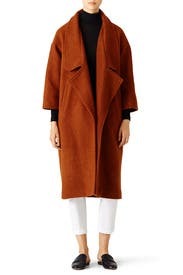 Love this coat so much that I am trying to find it new. I wore this to a wedding and the only size avail was large. Could have used a medium but I still received so many complements. 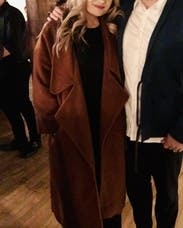 Great fall coat to wear over simple dress at my civil ceremony at city hall. I'm assuming it's the style of the coat, but it ended up making me look frumpy. Love it so much - I bought it! 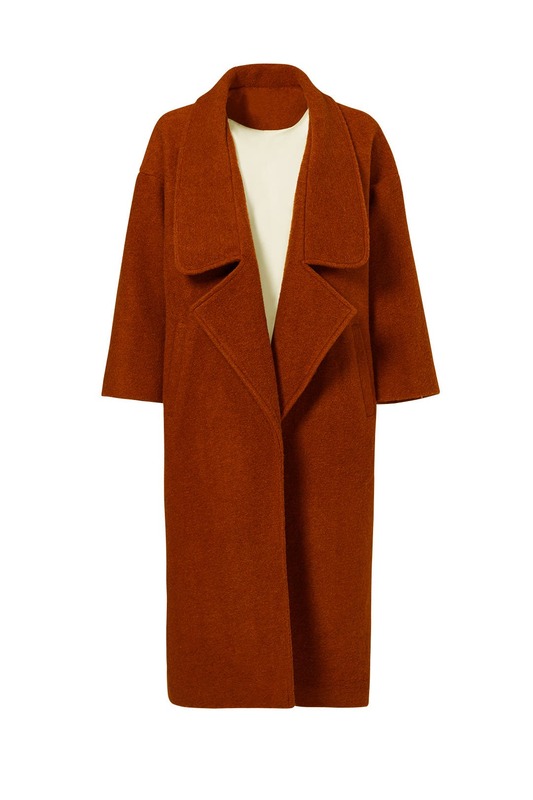 This coat is chic and simple and roomy enough to throw over anything. 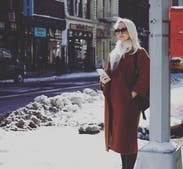 On cold days, I layer it over a fur vest for extra warmth... other days I drape it over something structured, and just let it hang open for a casual relaxed spin on a preppy look. Oversized fit, room for a sweater underneath, would imagine it would also look great over a dress. I loved this coat and am actually going to buy it. 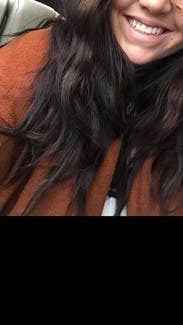 The length goes great with a long gown, and kept me warm at a outdoor Colorado wedding! Not super warm, and big for not being warm. Shows its wear and tear. Big, brown, and so damn stylish. I felt deliciously irreverent and funky in this coat. I kept it for two weeks and probably wore it 10 times. It's a great transitional piece, as it's cozy, but also open and with three-quarter sleeves. My boyfriend called it a "schmock" somewhat teasingly, but he also started loving it. It's just so cool. I'm now wishing I had bought it. Maybe if it's still around this fall I will. 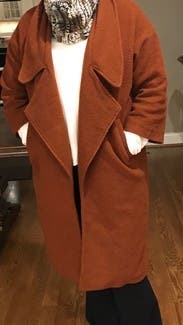 i wore this coat running around new york over thanksgiving weekend. it matched virtually everything i own and was surprisingly warm when paired with a sweater. I have never felt so chic! Rented this for my sisters wedding. Reception was outside and weather was supposed to be a little chilly. The weather ended up being beautiful and I wore it anyway because it was just so fun. Got plenty of compliments and just felt so put together! Loved it. Definitely oversized feel, but made it very comfortable. Sleeves are (purposefully) shorter. Loved wearing this one - warm, stylish and cozy. Great with a turtleneck. Fits large, as it should - it's a cocoon coat! OBSESSED. The burnt orange color is so on trend and so cute. It was a cute cocoon fit but just enough so it didn't seem baggy at all. I got so many compliments too! I'm 5'3 and this came down to the middle of my calves. 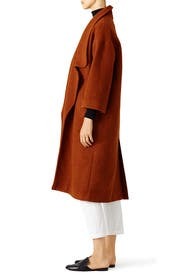 I've been reluctant to buy coats that are that long because I'm afraid that it would down me and make me look short. 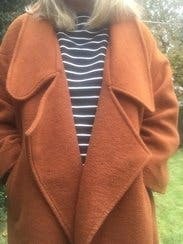 This coat has now made me a believer...well ok I'm less hesitant BUT this coat I'd rent again and again. 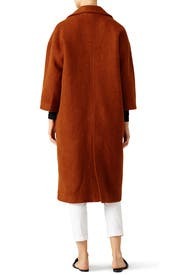 This coat is perfect for fall but don't rely on this to get you through the winter because it's not that warm. However there's ample space for you to wear a good thick sweater underneath. If I wanted to I think I could've still fit the XS but you want a slight loose look to it so I'm happy I went with the small. I really liked this coat. Even though it is supposed to be oversized I might try a small if I rent it again just because it felt borderline a little too big. This would be perfect for fall, but for winter you would want to belt it or something if you live somewhere that gets really cold. There is no closure on the front or belt, so it just hangs open a little. Also, the 3/4 sleeves can get a little chilly on cold days. But overall I really liked the quality of the coat. It looks a little more orange-y in photos than it does in person. Great coat for any occasion! This coat is great! Meant to fit a bit over sized but the sizing was correct, in my opinion. I have received so many compliments in all settings of which I have worn it - work, new years eve dinner, etc. Definitely considering buying.